Are Transportation Stocks About To Get Derailed? The Dow Jones Transportation Average (DJT) closed the week trading near an all-time high, but is also approaching a test of long-term channel-top resistance at the 7,200 level. 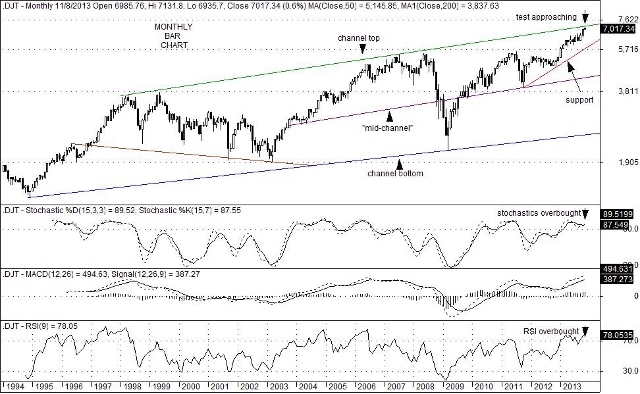 This upward sloping channel-top (on a semi-log basis) dates back to February 1998 and has contained all previous rallies. Since the DJT is considered to be a leading indicator of both the economy and the stock market, a failure to rise above 7,200 could suggest that a period of economic cooling and equity price consolidation could be on the horizon. Although a number of transportation stocks are concurrently approaching their respective highs, all are in overbought conditions and appear to be stretched. They include: Kansas City Southern (KSU); Kirby Corp. (KEX); GATX Corp. (GMT); FedEx (FDX); United Parcel Service (UPS) and others. 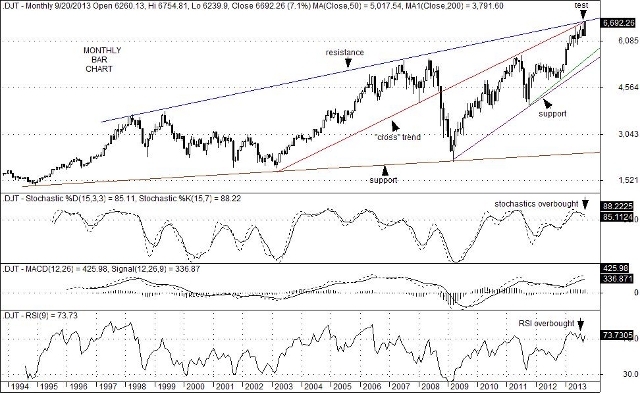 Some are forming bearish Head & Shoulders patterns like Union Pacific Corp. (UNP). Supporting the strength in transportation stocks on Friday was an unexpected jump of 204,000 in non-farm payroll. That, as well as a better-than-expected 2.8% rise in Q3 GDP appeared to move up the time-table of the taper occurring in December 2013 rather than in March 2014, however. While yields on U.S. Treasury 10-year notes did rise by 13.3bpt to 2.746% on Friday, a knee-jerk drop in equity prices did not. For the time being, that response should be seen is a big plus for equities. That being said, as good as these economic reports were, the November 1st report of a decline in October PMI to 51.1 from 52.8 did not presage a ramp up in economic growth. A rise in European unemployment to a record high of 12.2% along with a tiny rise of 0.7% in Eurozone inflation also was a concern to global growth and prompted Mario Draghi to cut short-term interest rates to a record low reading of 0.25% from 0.50%. Moreover, the sharp rebound in stock prices and rise in 10-year yields on Friday came as a result of a 204,000 rise in non-farm payroll, but clearly not because an outsized decline in total civilian employment, which shrank by a sobering 720,000 jobs (even when including the 204,000 figure). That oddity in the employment data, however, could due to the government shutdown experienced earlier in October and is likely flawed. If so, closer attention to future revisions should be paid. Over the short-run, the wealth effect of record high stock prices coupled with declining gasoline prices could keep the economy buoyed in coming weeks including the holiday travel and shopping season. In turn, that could help transportation stocks move higher still. Nevertheless, a failure to rise above the 7,200 level on the Dow Jones Transportation Average coupled with a rise mortgage and/or interest rates could be a warning that growth expectations for next year could fall short of current hopes. Despite overbought conditions on monthly charts, the Dow Jones Transportation Average (DJT) is again testing long-term trend line resistance now at the 6,755 level. No doubt, the Fed’s unexpected decision to keep the level of security purchases at an $85 billion monthly clip has played a big roll in the current vibrancy. Continued strength in railroad and airline stocks and a recent display of strength in shipping stocks have also contributed to the strength in the DJT. While the degree of domestic and global economic strength is an on-going debate, it is clear that a series of reports from China, Japan, Europe and of course the U.S. have demonstrated that freight, cargo and passenger profitability is gaining some traction. Still, a political showdown in Washington over the debt ceiling and Obama-care that threatens a government shutdown is now brewing. And while the U.S. involvement in the Syrian crisis as been toned down quite a bit, it has not really gone away. Moreover, there are a number analysts, investors and CEOs that see growth expectations muted right now. If that assessment is accurate, further upside gains in the DJT might be restrained as well. It might be worth pointing out that since 1996, the DJT tested this key trend line resistance in 1997 and again in 1998, just before Russian ruble collapsed and triggered a crisis on Wall Street due to leveraged positions at Long Term Capital Management. The next time this same trend line was tested was in 2007 and (almost) again in 2008 just before the housing/banking crisis hit Wall Street. No doubt, the fact that the DJT is again testing this same resistance barrier is troubling to economic historians. The technical set-up on long-term charts of the Dow Jones Transportation Average clearly favors a correction to begin soon. In a world where it does not reward investors to fight-the-Fed however, a breakout to the upside would likely catch a number of investors off-sides. One last wrinkle to consider is the roll that the Dow Jones Transportation Average playing in Dow Theory. It purports that transportation stocks must lead industrial stocks in order to advance a bullish trend. Thus, a break above key long-term trend line resistance currently at 6,755, could ignite a broad-based advance in equity prices, if it occurs. If it does not however, a period of distress could emerge instead. You are currently browsing the archives for the Dow Jones Transportation Average (DJT) category.